Vanaf het dakterras kijk je neer op de drukte en trek je uit voor een avondwandeling langs Church Street naar de beroemde trappen van de abdij of naar Tate Sands, onder de abdij, waar het schip van Dracula verging. Wanneer de bel gaat, gaat u uit met een drankje om te kijken naar de opening van de brug en de jachten die naar zee gaan en de visser die 's avonds terugkeert met hun vangst. Als er een betere plek in Whitby is om de wereld voorbij te zien gaan, moet ik hem nog vinden en ben ik al meer dan 50 jaar op bezoek! Lichte, luchtige badkamer met toilet. Luxe tweepersoonsbad met kranen in het midden. Over bad douche. Designer spiegel met verlichting. 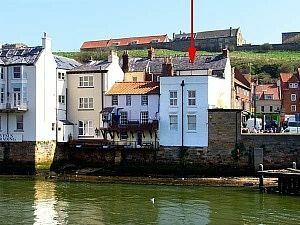 Buiten: Het grote terras heeft een van de beste uitzichten in Whitby en ondanks het uitzicht op de stad is het niet over het hoofd gezien! Het terras heeft veiligheidsleuningen eromheen, die het uitzicht niet verstoren. Er is een grote opslagruimte buiten op het terras met stoelen en een barbecue. Bijkeuken: Kleine kamer met stofzuiger. Schoonmaak / Handdoeken / Linnen / Schoonmaakservice: Beddengoed en theedoeken inbegrepen, en een handdoek. Breng eigen bad / strandlakens mee. Het pand wordt professioneel schoongemaakt en het linnengoed wordt na elke gast vervangen. Aan speciale gelegenheden kan worden voldaan met een persoonlijk tintje. fantastic chill out in a perfect location! Had a fantastic stay! Great location, lucky to get lovely weather in feb, not quite sitting out but lovely to open the door and watch the world go by! This apartment has everything you need, especially decent hot water/heating which often isn't the case! Plenty of little extras that you need such as hooks for coats, wash up liq etc!. Great bath to relax with a glass of wine in! It has 2 good bedrooms, the master on the top, we chose to stay to stay in the 'kids' room, which was lovely cosy & comfy (sore foot, one less set of stairs!). Easy to unload outside, free parking at the abbey in winter. (I wish Id have thought earlier and asked if we could have dumped our bags when we arrived before check in time as too heavy to carry down from car park so had to get car again, no parking nearby at all as digging one car park up!) Have to recommend The Star Inn the Harbour for a great meal. Lovely staff and the food is excellent. Maybe pay a bit more but worth it! We had a lovely stay, wish we were back there! What a wonderful review - thank you so much for taking the time to post it. It is indeed our 'home from home' and we are genuinely delighted when guests love it as much as we do. I hope you do visit again one day - reduced rates for returnees! Thanks again for your lovely comments. I booked this Appartment for the weekend for my self and My Mum. We couldn't have built a better place. The location is fantastic, smack in the middle of the Town. Really good size rooms, comfortable and very clean. Every thing you will need is already there. If that's not good enough then there's the Roof Terrace. WOW! This blew me away. Even if the the accommodation was twice as expensive, this Roof Terrace would make it worth every penny. I can't recommend this place enough. I will be hopefully returning with my partner. What a wonderful review, many thanks! So glad you enjoyed Swing Bridge Lookout as much as we do. You are right the roof terrace is the icing on the cake. Welcome back anytime! We had a lovely couple of days in Whitby. The apartment had everything we needed, comfortable and cosy. The roof terrace was amazing, fantastic views - loved it. Looking forward to another visit. So pleased you enjoyed your stay, and thank you for your comments. Welcome back anytime! Loved it! Great flat with loads of room. We enjoyed using the terrace, watching the swinging bridge. My son is planning a second trip. Thank you for your positive comments. So glad you enjoyed your stay, welcome back anytime! Twee minuten lopen langs het beschutte strand van Tate Hill Sands, waar Dracula's boot landde! Vijf minuten lopen over de Swing Bridge naar de westkant van de rivier en langs de uitgestrekte vlakte van Whitby Sands, die zich over 3 kilometer uitstrekt helemaal naar Sandsend. De hoofdwegen van en naar Whitby zijn de A171 en de A169. Het Whitby treinstation ligt op ongeveer 500 meter van het huisje, ongeveer vijf minuten lopen, taxi's beschikbaar. Een auto is niet nodig omdat alle voorzieningen op loopafstand zijn. Dichtstbijzijnde luchthaven is Durham Tees Valley (Teesside) op 45 mijl, ongeveer 1. 5 uur met de auto. Robin Hood's Bay 6 mijl. Booking Notes: Initial contact by email. Deposit of £50 needed to secure booking. This deposit is fully returnable if you cancel at least 6 weeks before the start of your holiday. Balance is due 4 weeks before your arrival date. Once the balance of your holiday has been paid we regret we are unable to make any refund. We recommend that you take out holiday insurance to cover any unforeseen eventualities. Payment by bank transfer. Changeover Day: We are flexible on changeover days for short breaks EXCEPT SATURDAYS. Normally we expect week long bookings in the high season, Friday to Friday. Please contact us for other days. Short breaks available all year outside of busy holiday periods. Notes on prices: Prices are for the property per week in UK pounds. Short breaks at off peak times are available, e.g. 3 nights from £150. The above pricing does not include special event weekends - Goth weekend, 60s weekend, Scooters, Regatta, Folk Festival etc. Please contact us for prices.